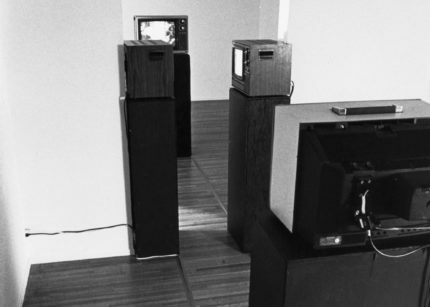 The work is installed in two identical adjacent spaces connected by a passage. In the center of the two spaces, two color monitors positioned on two tall pedestals with built-in speakers face each another. On the inside walls of the passage and perpendicular to the line of sight through the passage are two other color monitors, also facing each other and positioned at eye-level on pedestals (or wall mounted). The width of the passage, including the depth of the monitors, is narrow enough that the viewer considers turning sideways. The structure of the work is built upon two spoken texts that describe two distinct scenes in a detailed manner. The texts are of the same length, with the last three sentences of each being identical. Each is amplified from one of the spaces. If the viewer stands in the passage, the spoken texts are equally heard. As the viewer moves from one space through the passage to the other, one of the texts becomes dominant. Displayed on the two monitors in the spaces are images referring specifically to the two texts. The space in which each text is heard reflects the words by displaying the specific images of the one text in the foreground, with the images referring to the other text in the background. The other space then displays the exact opposite relationship of the images—the background images become the foreground images and vice-versa. The passage monitors always display the same abstract image: two grid-like panels that slowly enter both sides of the frame symmetrically. 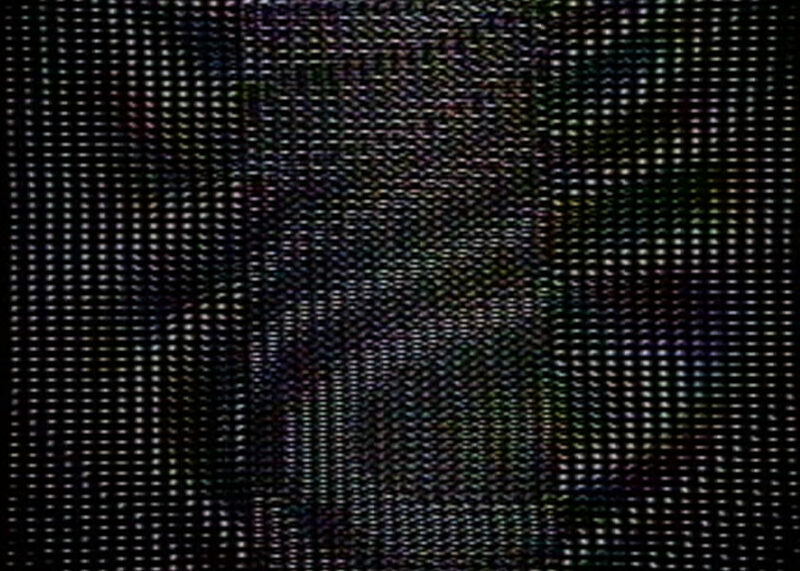 As they reach the center they completely overlap, producing a moiré pattern. This coincides with the moment that the two texts are heard saying the same last three sentences: “I left the room exiting to a hallway. It was long enough to form extreme perspective looking in either direction with doors to other rooms on both sides. I crossed the hall and entered the room opposite me.” Wherever the viewer is within the space, the spoken text for a moment acoustically causes the two spaces to merge as it phase-shifts throughout the space. 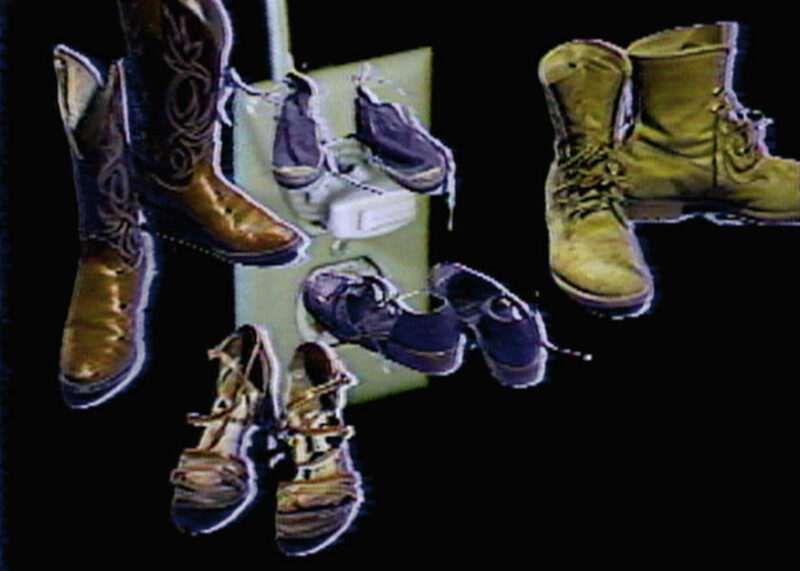 Once the texts are completed, they begin again in the opposite space and the foreground and background of the images change accordingly. The grid panels on the passage monitors continue across the screens until they disappear. This coincides with the last sentence being heard again. 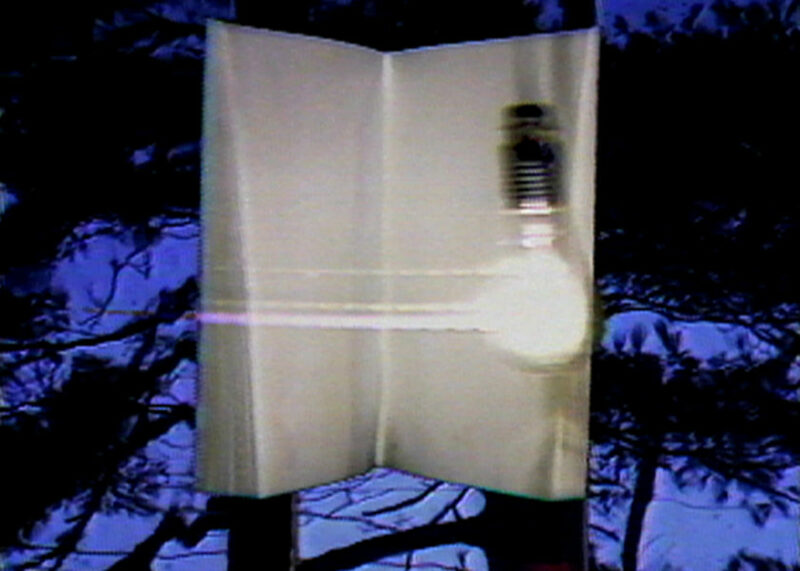 An example of this work was first exhibited at the Long Beach Museum of Art, Long Beach, California, from March 28 – May 2, 1982 as part of the exhibition "Gary Hill: Equal Time." LBMAVIDEO: Long Beach Museum of Art Alliance Video Council Newsletter 2, 3 (May – June 1982), unpaginated. Podesta, Patty. “The Lower Depths. Notes from L.A.” 1982. Furlong, Lucinda. “A Manner of Speaking: An Interview with Gary Hill.” Afterimage 10, 8 (March 1983), pp. 12, 15, 16. Video: A Retrospective. 1974 – 1984. Long Beach, California: Long Beach Museum of Art, 1984, pp. 74, 105. 2e Semaine International de Video. Geneva: Bel Veder, Centre Génevois de Gravure Contemporaine, 1987, p. 63. Morgan, Robert C., ed. Gary Hill. Baltimore: PAJ Books / The Johns Hopkins University Press, 2000, pp. 201, 203 – 204. Gary Hill: Selected Works and catalogue raisonné. Wolfsburg: Kunstmuseum Wolfsburg, 2002, GHCR 45, pp. 81, 101 – 102. Quasha, George and Charles Stein. An Art of Limina: Gary Hill’s Works and Writings. Barcelona: Ediciones Polígrafa, 2009, pp. 24, 100 – 110, 578, 603. Note: This text is also used in the single-channel work of the same name. A voice spoke from the corner of the room. It was not at a right-angled corner. It was a wedge-like shape lit obtusely from a light bulb hanging on white zip cord inches above the floor. The cord extended to the ceiling where it was attached and guided by a set of screw eyes evenly placed diagonally from the center area of the ceiling to the opposite corner. From there it continued back down again and ended at a receptacle, level and eight feet of distance with the bulb. Two walls of the room were parallel, one longer and extending into the wedged corner. On the ground and against the walls were small piles of frosted glass equal in mass and shape. The piles and light bulb when seen as three points formed an imaginary line. On one side of the line a voice spoke its thoughts from the wedged corner projecting them out towards the light. On the other side an animal sat in a folding chair embracing itself making inaudible high-pitched sounds. The room was otherwise empty except for two stacks of sheets compressed between floor and ceiling for structural purposes. The separateness of the two stacks could only be distinguished by an occasional acoustical smear. I left the room exiting to a hallway. It was long enough to form extreme perspective looking in either direction with doors to other rooms on both sides. I crossed the hall and entered the room opposite me. It was early afternoon and the room was well lit by natural light. Rows of windows filled the walls except one which was freshly painted. A cluster of plumbing fixtures ran up through a template shape in the floor and out through another template shape in the wall close to the ceiling. The fixtures were galvanized steel and visually separated the empty wall from the entrance to the space, a cement archway. People congregated in the middle of the room drinking, talking and smoking. They were unnecessarily close to each other with an eight-foot band of floor space surrounding them. I walked around the room in the space allotted to me, observing the people and looking out the windows to the streets down below. The noise from the traffic was inordinately loud, being several stories down, compared to the people’s voices which were unintelligible at only a few paces away. The aural distortion may have been formed by an elaborate draft caused by the sheer amount of windows and the way in which they were open. Moving one’s head from side to side revealed a sinusoidal shape sequencing from partially opened to partially closed windows. The peoples’ drone unexpectedly faded as they noticed wet paint on their clothes, hands, drinking glasses and faces. I left the room exiting to a hallway. It was long enough to form extreme perspective looking in either direction with doors to other rooms on both sides. I crossed the hall and entered the room opposite me.